Am seriously fed up now with being ill. This bug is in it's 7th day. It looks bloomin' cold outside and I'm glad I'm indoors, but the feeling of being drained and bunged and achey is getting on my nerves. Each time I feel a tad better, my temperature goes up again and I conk out on the sofa. Haven't left the flat since I got home from school last monday. Most of the time I haven't even got dressed. 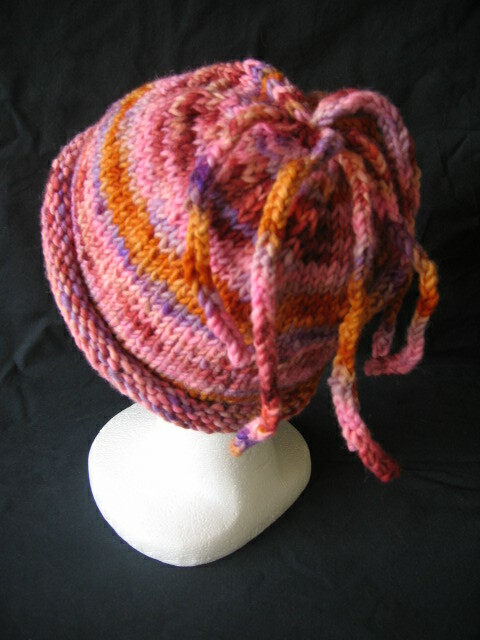 True, I have been partaking in easy knitting - all these hats made since my last post, with another half done on the needles and one I frogged 'cos I added cables and it didn't suit the yarn. But still, I'd like to feel some energy again and less clammy. I'd like to stop coughing and talk without feeling my voice is gonna pack up at any time. Tsk. Ok, positive thinking time. I've added more photos to my Flickr album of these new babies. I've nearly run out of that yummy hand-dyed yarn I got Handweavers - am just gonna have to go back to buy some more. Shame. Oh, and Beverley has started a Hat Knit-along blog. Of course I'm a contributor ;) Check it out if you fancy joining. Hats rule, man. 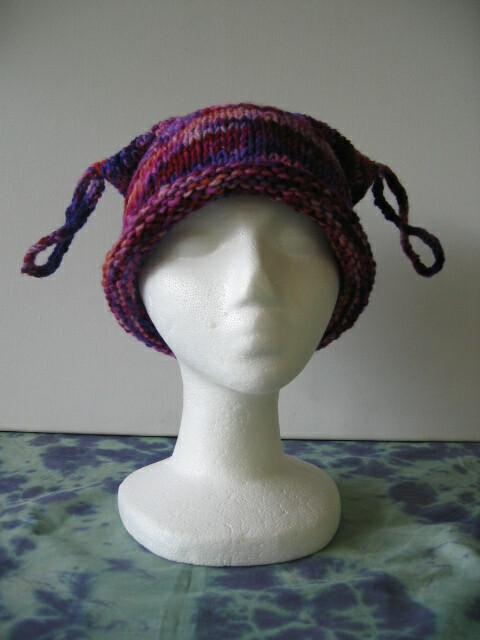 I also warmed to Lhizz's suggestion of hat kits... then I got thinking about making the needles myself - maybe fimo decorated ends for beginners kits - and dyeing the yarn too - so many ideas. Lhizz (Octopusgrrl) was a bit of a star, as I checked into her journal and found even more info on setting up for Craft Markets :) I also think I've solved the problem of material costs - won't be reducing quality, as Nikki was concerned about; just maybe going wholesale. I've listened to everyone's advice about pricing, and this bit scares me. I also asked a few folk in other groups I belong to, and there is a tendency to undercharge, like seriously undercharge. Ouch. Are most buyers still not appreciating hand-made goods? From what some people have said, they're not considering their market properly (and I'm not referring to anyone who's commented here, btw) Now, I know the festival/arsty/alternative/hippy market maybe a little too well - have lingered there probably a little too long so know what goes on (man) Also, I am using pure wool, each item individual and (hopefully) a little bit quirky. And I would like between £15 - £20 for each hat. Surely that can't be too much? Each one is taking me between 3 and 4 hours to make... so after material costs I won't even be making minimum wage. A lot of it, I suppose, depends on where you sell. There's a big difference between craft fairs and craft markets. And I'm not going the church hall route. I want to market my stuff properly; signs and banners, leaflets on after-care etc. And as Helen pointed out, maybe having demo's will encourage folk to buy and pay the right price. Oh, I don't know. This is all too much thinking for one day. I did have a more cohesive rant in my head and have it all sussed but the words aren't coming out right. Poor little Spook isn't well either - she's been sick countless times already this morning. It's probably just a stubborn hairball but I'm worried about her. Minky's just emerged from behind some stuff, looking all coy- she's kidnapped another twist-tie. I think I'm gonna switch my brain off and go back to bed. 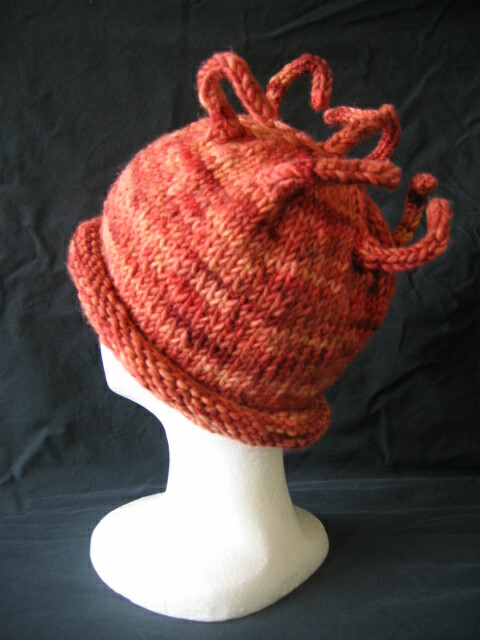 Maybe I'll stick some mindless daytime TV on and finish this next hat. Hopefully I'll daydream lovely thoughts about our bus and future happy times.